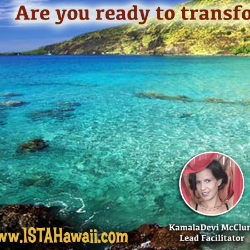 You are invited to unfold your potential with international facilitators: KamalaDevi McClure as lead and Xavier Bouquillard and Ellie Wilde will be co-facilitating this profound initiation. and a powerful clearing and activation process. No prior knowledge of shamanism or sacred intimacy is necessary and people with previous experience are welcomed. Couples or singles of any relationship preference may attend. The greater mix of prior experiences the richer the training! The event is located in a small secluded retreat center, very close to beaches, and swimming with dolphins in Kona, Hawaii! We bring in top leaders in the fields of sacred intimacy, personal development, and shamanism, some traveling long distances. If you are feeling drawn to this training, it is no accident. 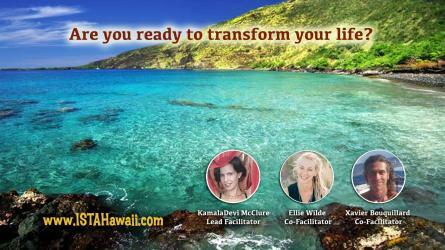 Your commitment to attend is a commitment and investment in yourself and your personal growth. In addition to our usual 6 day, 6-night SSSex ISTA Level One training program, this event offers you the option to stay and enjoy the special beauty of the area! You can contact the retreat to book more days. For tax simplicity we prefer only a deposit now, and the rest after Jan 1st.